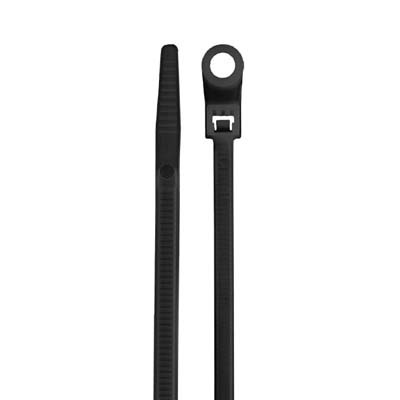 This 7” black nylon tie with a mounting hole has an angled tail providing quicker insertion alignment and a tail finger grip allows easier handling and tightening. They are the best cable ties we have to offer! 100 cable ties per bag. Product-specific information: Product details, Specifications, Dimensions. This 14” white nylon tie has an angled tail providing quicker insertion alignment and a tail finger grip allows easier handling and tightening. They are the best cable ties we have to offer! 100 cable ties per bag. DIRECTV™ approved. Product-specific information: Product details, Specifications, Dimensions. This 7” white nylon tie has an angled tail providing quicker insertion alignment and a tail finger grip allows easier handling and tightening. They are the best cable ties we have to offer! 100 cable ties per bag. DIRECTV™ approved. Product-specific information: Product details, Specifications, Dimensions.